The newly renovated Lava Tree Tropic Inn has a wrap-around lanai (verandah) with three separate sitting areas where you can enjoy your morning coffee, relax with a good book, or just sit and take pleasure in the view. 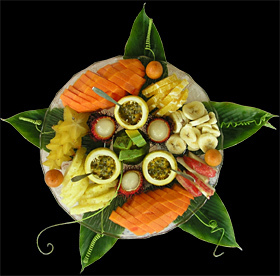 Our delicious continental breakfast includes fresh homemade bread and jam, tropical fruits, juice, and fresh-brewed coffee or tea. A special European snack is available in the afternoon. 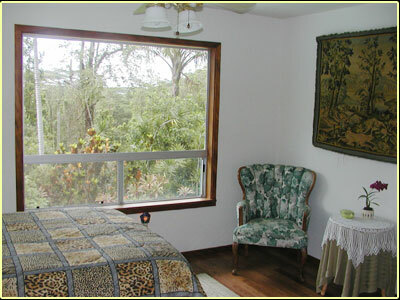 Guests enjoy the comfort of a charming living room, TV room with VCR, DVD and an office with telephone, fax, and Wi-Fi. A special meditation room is also available for relaxation, yoga, small group seminars, and receptions. Guests are welcome to pick and process their own macadamia nuts from the orchard. 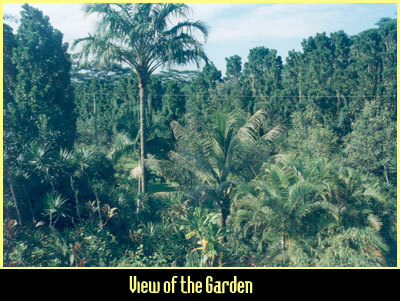 All of the guest rooms are located on the second floor, overlooking lush, tropical gardens. There is also a convenient laundry room. 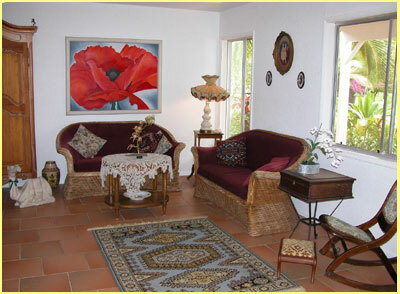 is a deluxe accommodation with an adjoining powder room and sitting area. The suite has a king size bed. Private bathroom with Jacuzzi tub. a spacious room, with a queen bed. 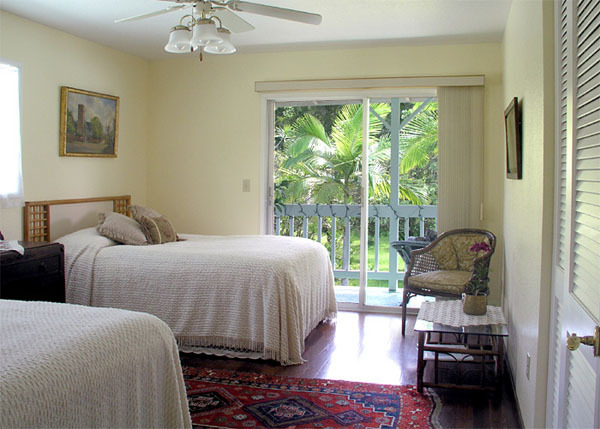 It opens to a private lanai, with beautiful view to the garden. 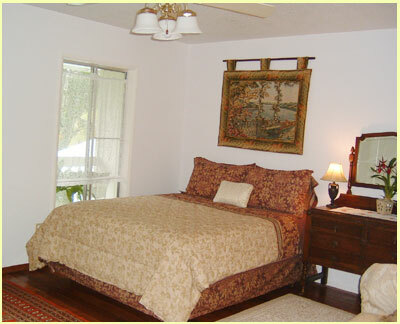 is a large room, with two double beds opening onto a private lanai. Shared bathroom. 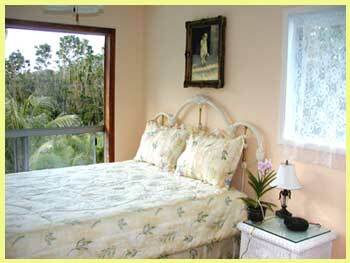 has spectacular views, surrounded by windows with a queen size bed. Shared bathroom. 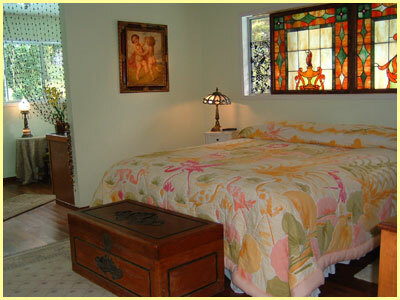 is light and cozy with one double bed. Shared bathroom.  Rates are based on double occupancy. 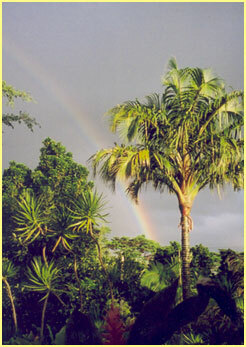 (There is an additional $35 per extra person per night).  One night deposit is requested for one to three nights stay, at the confirmation of the booking. Over three nights, the deposit is 30%.  All rates are subject to an 13.42% Hawaiian tax.  Check in time is between 3pm and 6pm. Please let us know in advance if you are arriving later.  Check-out time is 12 noon. 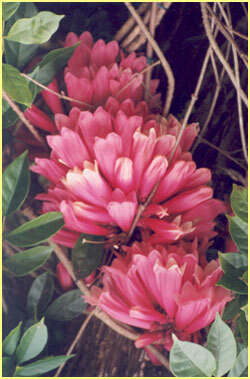  Smoking is not permitted in the inn, it is allowed outside of the house, on the lanai or in the garden only.  No pets are allowed on the premises. Refunds are made if cancellation is received more than 14 days prior to your scheduled arrival date, or if we are able to re book your room. A twenty dollar fee applies to all cancellations. Gift certificate reservations are subject to the same rule.